should be approximately 1 mm wide and should extend well into the proximal embrasures when viewed from the incisal (occlusal) side (Fig. 9-8). Where access permits, establishing this shoulder from the proximal gingival crest toward the middle of the facial wall is preferred. 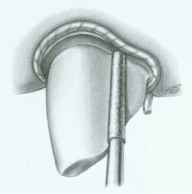 This will minimize placement of the initial shoulder preparation too close to the epithelial attachment. If the margin is established from facial to proximal, a tendency exists to "bury" the instrument and encroach on the epithelial attachment. A conscious effort to maintain proper margin position relative to the crest of the free gingiva is critical (see Fig. 7-49). The location and specific configuration of the facial margin depend on several factors: the type of metal-ceramic restoration selected, the cosmetic expectations of the patient, and operator preference. To ensure esthetics, the shoulder margin must extend into the interproximal area. Fig. 9-8. A, The facial shoulder preparation should wrap around into the interproximal embrasure and extend at least 1 mm lingual to the proximal contact. B, The shoulder preparation extends adequately to the lingual side of the proximal contact. Note that on the mesial (visible) side, the preparation extends slightly farther than on the distal (cos-metically less critical) side. use of supragingival margins to posterior teeth (Fig. 9-9) and to un-discolored anterior teeth (in which case a porcelain labial margin is preferred; see Chapter 24). The optimum location of the margin should be carefully determined with the full cooperation of the patient. Where a subgingival margin is to be placed, careful tissue manipulation is essential; otherwise, there will be damage that leads to permanent gingival recession and subsequent exposure of the metal collar. This is most effectively avoided through meticulous gingival displacement with a cord before finishing (Fig. 9-10). The configuration of the margin is also finalized at this time (Fig. 9-11). Axial Reduction ofthe Proximal and Lingual Surfaces. (see Fig. 9-2, M to P). Sufficient tooth structure must be removed to provide a distinct, smooth chamfer of about 0.5 mm width. 6. Reduce the proximoaxial and linguoaxial surfaces with the diamond held parallel to the intended path of withdrawal of the restoration. These walls should converge slightly from cervical to incisal or occlusal. A taper of approximately 6 degrees is recommended. On anterior teeth, a lingual concavity is prepared for adequate clearance for the restorative ma-terial(s). Typically, 1 mm is required if the centric contacts in the completed restoration are to be located on metal. When contact is on porcelain, additional reduction will be necessary. For anterior teeth, usually only one groove is placed, in the center of the lingual surface. 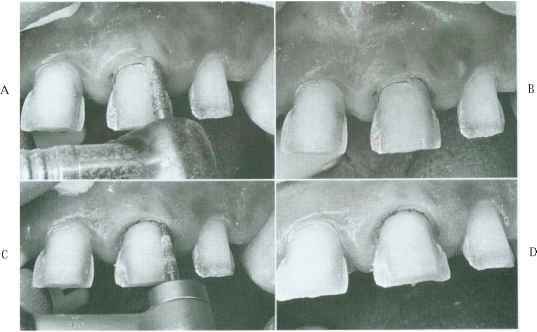 For molars, three grooves can be placed in a manner similar to that described for the all-metal complete cast crown. Fig. 9-9. Supragingival margins on the maxillary premolars. They were possible because of a favorable lip line hiding the cervical aspect of these posterior teeth. 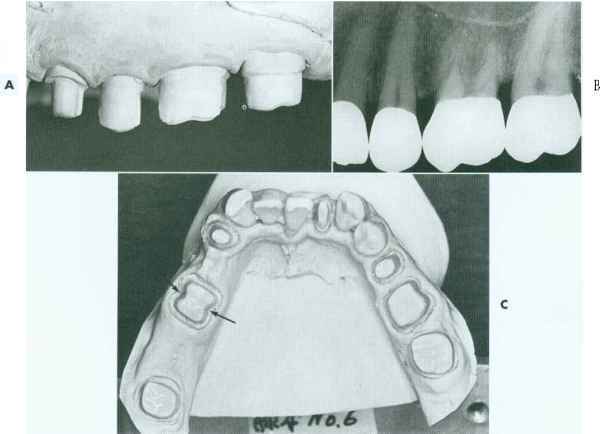 The subgingival margins on the mandibular premolars were prepared only because of previously existing restorations. 7. Make a lingual alignment groove by positioning the diamond parallel to the cervical plane of the facial reduction. When the round-tipped diamond of appropriate size and shape is aligned properly, it will be almost halfway submerged into tooth structure. Verify the alignment of the groove, and carry the axial reduction from the groove along the lingual surface into the proximal; maintain the originally selected alignment of the diamond at all times. Fig. 9-10. A, A gingival displacement cord (under tension) is placed in the interproximal sulcus. B, A second instrument can be used to prevent it from rebounding from the sulcus after it has been packed. Fig. 9-11. A, After tissue displacement, the facial margin is extended apically. Caution is needed, because if the diamond inadvertently grabs the cord, it may be ripped out of the sulcus and traumatize the epithelial attachment. B, Note the additional apical extension of the shoulder on the distal aspect. C, The entire facial shoulder is placed at a level that will be subgingival after the tissue rebounds. D, The facial margin has been prepared to the level of the previously placed cord. Fig. 9-12. A lingual chamfer is prepared to allow adequate space for metal. A smooth transition from interproximal shoulder to chamfer is essential. that resulted from the shoulder preparation can be used as a reference for judging alignment of the rotary instrument (Fig. 9-13). 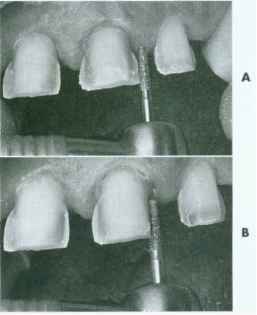 The interproximal margin should not be inadvertently placed too far gingivally and thereby infringe on the attachment apparatus. It must follow the soft tissue contour (see p. 150). On posterior teeth, the lingual wall reduction blends into the functional cusp bevel placed during the occlusal reduction. Anterior teeth require an additional step: After preparation of the cingulum wall, one or more depth grooves are placed in the lingual surface. These are approximately 1 mm deep. 9. Use a football-shaped diamond to reduce the lingual surface of anterior teeth (see Fig. 9-2, P). It is helpful to stop when half this re duction has been completed to evaluate clearance in the intercuspal position and all excursions. The remaining intact tooth structure can serve as a reference. Finishing. The margin must provide distinct resistance to vertical displacement of an explorer tip, and it must be smooth and continuous circum-ferentially. (A properly finished margin should feel like smooth glass slab.) All other line angles should be rounded, and the completed preparation should have a satin finish free from obvious diamond scratch marks. Tissue displacement is particularly helpful when finishing subgingival margins (Fig. 9-14). Sometimes this step is postponed until just before impression making after tissue displacement. Fig. 9-13. 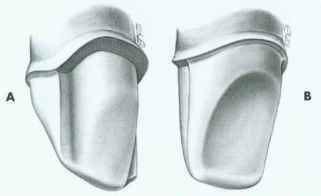 A, Proximal reduction of the flange with a facial approach. B, Once sufficient tooth structure has been removed, the cervical chamfer is prepared simultaneously with the lingual axial surface. After the distolingual preparation has been completed, the mesial chamfer is blended into a smooth transition with the shoulder. Fig. 9-14. Controlled tissue displacement can be helpful when finishing the margin with a fine-grit diamond or another rotary instrument. Fig. 9-15. A, Completed preparation. 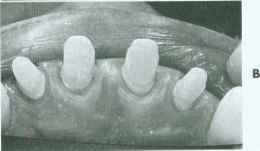 Note that the transition from incisal to axial walls is rounded, and a distinct 90-degree or slightly sloping shoulder has been established. B, Even chamfer width and a smooth transition between lingual and axial surfaces. The chamfer is distinct and blends smoothly into the facial shoulder. Fig. 9-17. The shoulder bevel. Fig. 9-16. A, 90-degree shoulder. B, 120-degree shoulder. C, Shoulder bevel. Fig. 9-18. A, Facial and B, lingual views of metal-ceramic preparations. bur or hand instrument, depending on the length of bevel required (Fig. 9-17). Generally a short bevel with a cavosurface angle of 135 degrees is advocated, although longer bevels have been recommended for improved marginal fit. Special care must be exerted where the bevel meets the interproximal chamfer. The chamfer and bevel should be continuous with each other. Care must be taken not to damage the epithelial attachment during beveling; tissue displacement before preparation of subgingival bevels is recommended. Fig. 9-19. The "wingless" variation does not exhibit the defined transition from chamfer to shoulder seen in Fig. 9-15. Rather, the shoulder gradually narrows toward the lingual side. Interproximally, the same criteria for minimum extension of the shoulder apply as for the wing-type or flange preparation. Fig. 9-20. Metal-ceramic crowns used to restore maxillary incisor teeth. A, Metal-ceramic preparations on the maxillary premolars in conjunction with more conservative preparations on the molars. B, Buccal view of the preparations. 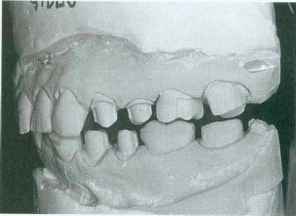 Note that, by comparison, considerable tooth reduction was needed on the premolars to accommodate metal-ceramic restorations. 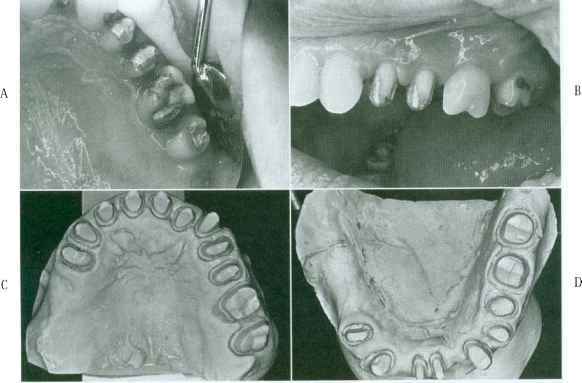 C, Except for the molars, all remaining teeth in this patient have been prepared for metal-ceramic restorations. Note the subtle variations and modifications of the same underlying theme: wing-type preparations on the anterior teeth, wingless on the premolars. D, Mandibular arch of the same patient. Many of the smaller mandibular teeth were prepared with wingless restorations. Because of previously existing restorations, excessively heavy shoulderlike chamfers resulted on some of the posterior teeth. 1. What are the indications and contraindications for metal-ceramic crowns? 1. What are the advantages and disadvantages of metal-ceramic crowns? 3. What is the recommended armamentarium, and in what sequence should a maxillary central incisor be prepared, for a metal-ceramic crown? 4. What are the minimal criteria for each step described above. Why? 5. What are the differences between wing-type and wingless preparations? When would one be used over the other? Why? 6. Discuss how to determine the buccolingual position of a proximal groove to precisely obtain the desired position of the facial finish line.